Now that our bathroom and closet project is complete, we wanted to let you know how pleased we are with the final product. We had a vision of what we thought our bathroom would look like and how space-efficient our closet would be. But, safe to say, we are delighted to tell you that the beauty and functionality of the bathroom and user-friendly closet far exceeded our expectations. You, your team and group of sub-contractors added much value to the rooms and to the process. Admittingly, we had limited knowledge of how a project such as our was to be planned out and executed. We therefore had to lean on you for advice and counsel to make sure that you “protected us from ourselves”; and you didn’t disappoint. 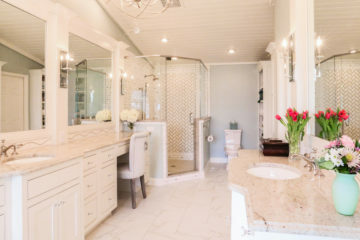 Not only is the bathroom beautiful and the envy of many of Linda’s friends, but the improved structure of the room from the floor to the ceiling to the walls gives us comfort to know that the rooms are encased in a solid structure. We agree that the end product far exceeded our expectations. It is also important to emphasize that your team (Dave, Dave, Kevin, Don) and the group of subcontractors were outstanding. Not only were all very skilled at their trade, but were extremely pleasant to work with and were men of high character. We honestly believe each and every one of them sincerely cared about the quality of their work and contributed to enhancing the final product. Thanks again for making this a good experience for us and ensuring that we will enjoy our new bathroom and closet for years to come.